This is the Nieuw morphotype of Gorteria diffusa, which exhibits striking dark petal spots at the bases of some ray florets. Scale bar = 1 cm. Credit: Courtesy Meredith Murphy Thomas. Dark spots on flower petals are common across many angiosperm plant families and occur on flowers such as some lilies, orchids, and daisies. Much research has been done on the physiological and behavioral mechanisms for how these spots attract pollinators. But have you ever wondered what these spots are composed of, how they develop, or how they only appear on some but not all of the ray florets? Dr. Meredith Thomas from the University of Cambridge and associates from England and South Africa were interested in exploring these questions and published their findings in the December issue of the American Journal of Botany. 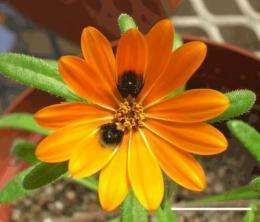 They focused on the South African endemic beetle daisy Gorteria diffusa (Asteraceae), which has a unique, raised, dark spot at the base of some of its ray florets. "I find this plant/pollinator system very exciting to study because of the amazing morphological variation in the flowers between populations," Thomas said. "The spots on the flowers mimic the plant's pollinator, a small fly, which is attracted to the plant because of the spots. The plant is dependent on the pollinator for reproductive success, so it's incredibly important that the plant attracts the flies. "What we found surprising," Thomas continued, "was how complex the petal spots are in a few populations, when other populations seem to get by with a very simple spot or even no petal spot at all." By peeling away layers of the tissues that make up the spots on mature ray florets and examining them under a simple dissecting scope, Thomas and associates found that the spots of G. diffusa are more complex than most. These spots are composed of three different types of specialized epidermal cells: the central highlight cells that reflect UV and lack pigment; the interior cells that are shorter, rounder, variously pigmented, and raised above the highlight cells; and, surrounding the spot, a circle of multicellular papillae that are swollen, shiny, and filled with anthocyanin. Moreover, each spot spans four congenitally fused petal lobes, meaning that each lobe contained only part of the spot (and only some cell types) in its genetic makeup. So what attracts the pollinators? Because there is a lot of spot variation in this species, the authors hypothesize that the elements that are found in common among the various populations, such as the presence of anthocyanin pigment or UV reflectivity, might do the trick. The authors also wanted to know how only a subset of the floral rays develops a spot. Using scanning electron microscopy the authors looked at how the spot developed, or its ontogeny, over time. They found that only the first few ray florets that develop contain the spots, whereas the rest do not. Thomas noted that "the plant has evolved a very clever way of distributing the pollinator-mimicking spots around the inflorescence so that they appear random, as if a few flies had just landed on the inflorescence, when in fact the position of the spots is mathematically pre-determined according to the plant's phyllotaxy [or the order and location in which new floral organs are initiated]." The authors hypothesize that the genes that control the appearance of the spot are turned on initially and then fade with time, such that only the first, and oldest, rays to develop have the spots. Thus, the development of the spots is complex not only at the cellular level, but at the organismal level as well. "What we now plan to investigate," concludes Thomas, "is whether the development of this adaptive floral trait is regulated by a similarly complex genetic regulatory pathway, or if this plant has simply co-opted and modified a pathway commonly used in plants to produce other types of specialized surface structures, like hairs." Probing Question: Why are flowers beautiful?